On Friday, March 25th members of the New England Regional Council of Carpenters protested in front of the site of the Chamberlain Heights Housing in Meriden, Connecticut, a low-income public housing facility. The protest was scheduled after the Connecticut Department of Labor issued a record 22 "Stop Work" orders on the site, where a $27 million renovation is under way. The orders were issued when workers on the site were found to not have workers compensation coverage, as required by law, and were not properly paying state and federal payroll taxes. There were also concerns that the workers were not legitimate "independent contractors" as indicated during an inspection of the site. The LaRosa Building Group is the general contractor hired by the Meriden Housing Authority hired for the project.
? ?Having workers on the job without any workers compensation is appalling. To allow people to avoid paying taxes on Housing Authority jobs in these times is a slap in the face to every tax payer in Connecticut,?? said Tim Sullivan of the New England Regional Council of Carpenters. The 22 workers join a list of hundreds of subcontractors on multiple other sites who have been issued ? ?Stop Work?? from the state for similar violations. Misclassification of workers as so-called "independent contractors" has become an epidemic in the construction industry. Not only does it strip workers of basic protections, it provides a significant competitive bidding advantage to contractors who cheat and deprives the state and federal government of significant tax revenues. The "Stop Work" orders and protest caught the attention of Connecticut House Speaker Chris Donovan, who stopped by the site. When protesters continued to gather at the site on March 28th, a second visit by Connecticut Department of Labor Wage and Hour Division netted yet another stop work order for violations. Protests will continue outside the project to highlight the misuse of taxpayer money and the blatant tax and insurance fraud by some of the subcontractors on their site. Additional coverage in the Hartford Courant. 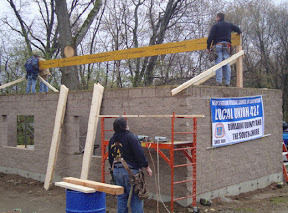 RI Carpenters Local 94 has been awarded a two-year, $250,000 ? ?Green Jobs?? training grant. Funding for the grant was made available by The Providence Plan/Building Futures for the delivery of services under the US Department of Labor-sponsored Energy Training Partnership Fund in Rhode Island. In early 2010, Secretary of Labor Hilda Solis announced nearly $100 million in green jobs training grants as authorized by the American Recovery and Reinvestment Act of 2009. The grants will support job training programs to help workers find jobs in expanding green industries and related occupations. These grants are part of a larger Recovery Act ?C totaling $500 million ?C to fund workforce development projects that promote economic grown by preparing workers for careers in the energy efficiency and renewable energy industries. The $250,000 grant awarded to Local 94 is part of a much larger grant in the amount of $3.7 million coming to Rhode Island to train 1,600 people for jobs in energy efficient construction and renewable power industries. The money will go to the Building Futures program sponsored by The Providence Plan, a nonprofit that works to improve the economic and social well being of city residents. Local 94? ?s portion of the grant calls for the training of 70 apprentices and 100 Journeymen from Rhode Island in four courses over a two year period. Courses to be offered will include: Awareness-Green Building, Lead RRP, Insulated Concrete Form Systems and Structural Insulated Panels. The Structural Insulated Panel class listens to guest lecturer Kevin Arcand, of Smithfield Rhode Island-based Branch River Plastics, a local and regional manufacturer of Structural Insulated Panels. The Department of Labor will be tracking the major grant outcomes, keeping in mind the goal of providing green, certifiable technical skills training to workers and the priority placement of those workers on green jobs or projects. The 8-hour Green Awareness classes started in October and are being scheduled on an ongoing basis. Both the Green Awareness and Lead RRP courses will be held in Rhode Island. The Insulated Concrete Form Systems and Structural Insulated Panels courses will be held at the New England Carpenters Training Center in Millbury, MA, because of space requirements. Both day and night/weekend courses are being scheduled. Because the classes are funded by grant money, they are currently available only to members of Rhode Island Local 94. All Local 94 members should have received a mailing regarding the grant and classes being offered. If you did not receive this information, or would like to find out more, contact instructor Charlie Johnson at Local 94 at 401-467-7070. Last week, Ray Buursma wrote a column that appeared in the "Holland Sentinel," a paper based in Holland, Michigan. It's striking in its blunt and straightforward premise: that American workers have gotten exactly what they've deserved over the last several decades. In short, he says they've taken for granted and significantly miscalculated the extent to which democratically elected representatives in a capitalist society would look out for their best interests. First, hundreds of thousands of manufacturing jobs went overseas while the politicians you elected did nothing to stop them. Yet you continue to elect leaders who offer nothing but tax cuts, as if that would stem the flow of disappearing jobs. Did you demand your leaders address America? ?s trade imbalance or continuous outsourcing of jobs? Did you demand your leaders require foreign countries to buy a dollar? ?s worth of American goods for every dollar of goods they sell here? No and no. You didn? ?t bother. You simply crossed your fingers and prayed, ? ?I hope my job? ?s not next.?? You made concessions to your employer and hoped that would stem the exodus of jobs, or at least yours. How? ?d that work for you? Second, you bought into the myth that unions are the cause of America? ?s demise. You didn? ?t bother to learn America became a world power when union membership was at its peak. You didn? ?t bother to learn America became the envy of the world while 1 of every 3 Americans was a union member. The rest of the column is equally enlightening/challenging. The New England Regional Council of Carpenters has developed state-specific Resource Lists of agencies and programs that can help members who are experiencing long-term unemployment and may require emergency assistance. The lists include services such as food, housing, employment, health care, counseling, fuel assistance and more. In addition, the United Way has set up a phone service in all states that helps connect people in need with appropriate services. 2-1-1 provides free and confidential information and referral. Please visit 211.org for more information. Members of Carpenters Local 210 joined a loud and spirited rally in Danbury over the weekend to support union workers in Wisconsin, where the Governor recently rammed through severe limitations on collective bargaining rights of workers. The rally was picked up by the Danbury News-Times. The story can be read here. The Building Trades Employers' Association (BTEA) and the Thomas S. Gunning Foundation have established a scholarship program to assist students who are enrolled in the Wentworth Institute of Technology Program through the New England Regional Council of Carpenters. Tom Gunning was a long-time member of the Board of Trustees for the New England Carpenters Labor Management Program and Executive Director of the BTEA. A scholarship in the amount of $2,000 will be made to a single winner this year, selected on the basis of academic record, potential to succeed, leadership and participation in school and community activities, honors, work experience, a statement of educational and career goals and an outside appraisal. Nearly three hundred people, including representatives from Carpenters Local 24, gathered last week at a hearing in New Haven, Connecticut, to urge stat Banking Commissioner Howard Pitkin to reject Buffalo-based First Niagara Bank? ?s proposal to purchase NewAlliance Bank, which is headquartered in New Haven. First Niagara President and Chief Executive Officer John R. Koelmel is seeking state regulatory approval for a merger that would make NewAlliance part of First Niagara. Opponents of the $1.5 billion deal point to First Niagara? ?s poor community lending record, while New Haven leaders have suggested concessions, including significant contributions to the city? ?s school reform and technology-oriented economic development efforts. NERCC Organizers in Connecticut worked together to reach out to members living in New Haven asking those interested to attend the hearing.
? ?We reached out to members living in New Haven, because this is the city that will be most directly impacted by this merger,?? notes Tim Sullivan, NERCC Organizer. ? ?We had an outstanding turnout by our membership, with over seventy-five members joining us at the hearing.?? As part of First Niagara? ?s business plan, the bank will make more than $1 billion in Community Reinvestment Act loans and other economic development initiatives within NewAlliance? ?s market over the next five years. CEO Koelmel claims the merger will help the local community with more dollars invested locally, more philanthropic giving and more community sponsorship. However, at the four-hour hearing held on Wednesday, speakers argued that the deal would destroy local jobs. While First Niagara said it will not close any of the 88 NewAlliance branches, they will eliminate over 200 jobs, making the claim that many will be added back by the end of next year. There is also great concern that the deal will dry up mortgage and business loans for low- and moderate- income residents. People also fear that many economic decisions would be made hundreds of miles away in Buffalo, NY. In his remarks given at the hearing, Sullivan emphasized the impact this may have on construction in the area. ? ?We do not want to see cranes become an endangered species in this vibrant city. We are very opposed to the loss of local control on loans and decision on capitol. We need a local partner in local decisions, not an entity in far away Buffalo? ?We are an industry very dependent on finance and the carpenters will not stand by silently when we see a potential for problems.?? Additionally, opponents emphasized that while NewAlliance has received ??outstanding?? Community Reinvestment Act rating, First Niagara routinely earns ??satisfactory?? ratings. Opponents fear the bank? ?s rating would be lowered if purchased by First Niagara. Speakers at the hearing also pointed out the estimated $23 million payout departing CEO Peyton Patterson stands to collect in the deal. Four bank directors would collect a combined $17.4 million. This is money many feel should stay in New Haven to support affordable mortgages and small-business loans. As Sullivan remarked, ? ?this [payout] does not seem to be in the interest of consumers, stockholders, or government. It could mean 600 fulltime jobs? ?It could mean a number of meaningful investments. It could mean police on the street, teacher aides in classes. This payout does no create new meaningful jobs in Connecticut. What it means is a wholesale layoff of Connecticut workers, higher rates and/or new fees for consumers and a fat payday for Peyton. Pitkin said he would review the statements made during the hearings, and any other documents the public might wish to provide him with about the proposed merger, and then make a decision. In addition to approval from the Connecticut Department of Banking, the Federal Reserve Board and the Office of the Comptroller of the Currency must also approve the merger. The work of union carpenters and Gilbane Construction in Westerly, Rhode Island was praised by visiting Senator Jack Reed and in the Westerly Sun today. The town recently built a new $6 million two-story science and technology wing onto their existing high school. It opened last month. Business Wire has the story. The CLEAN (Clean Local Energy Accessible Now) LA proposal would allow businesses and residents to install solar panels on their roofs and sell the power generated back to the local utility, creating the largest program of its kind in the United States. Known in policy circles as a feed-in tariff, or FiT, the plan would create $500 million in local investment and create 900 high-paying jobs each year for the next five years, all with a minimal impact on ratepayers. This week the legislature is holding hearings on the Governor's proposed budget cuts, which will profoundly impact Maine's public employees. This year, workers are under attack from many angles-- right to work for less, attacks on public sector workers, and a number of attempts to rollback worker rights & protections. The Governor has already disbanded the Task Force on Misclassification. That group was making real progress in fighting the 1099 scams plaguing the construction industry. In order to fight back these attacks, we all have to stand together in solidarity. Join public workers as at the State House this Thursday, March 3rd. You can greet legislators and 9am, be present for the public hearings, and then attend a rally at 12noon. If you live near Presque Isle, Houlton, Bangor or South Portland, buses are available for Thursday? ?s public hearing. Ride down with other workers & union members to the hearings and rally! Bus reservations are first come, first serve, sign-up today! See the bus schedule below and sign-up here .